Shines with blue rhinestone accents. 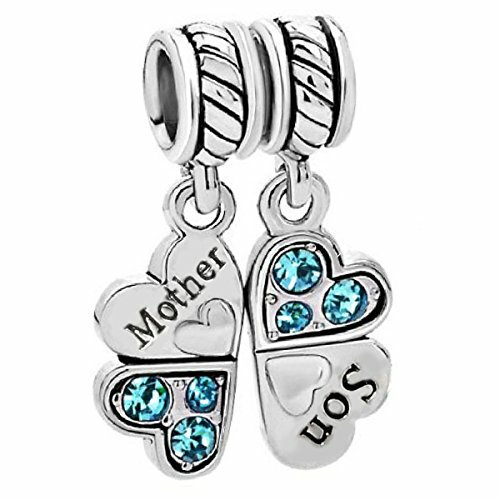 Brighten your European-style charm bracelets with this precious mother son sterling silver charm. Two pieces make up a complete charm. Give one half to your mom and keep the other half for yourself to show your mom how much you love her. Two pieces consists of a complete charm, but each half can be worn separately. Give one half to your love one and keep the other half for yourself. Solid 925 sterling silver (stamped) in antiqued-finish and blue rhinestones. Approximately 24mm high x 7mm wide for each half piece. The whole complete charm is approximately 24mm high x 14mm wide. If you have any questions about this product by Queenberry, contact us by completing and submitting the form below. If you are looking for a specif part number, please include it with your message. Shally 'I Love You To The Moon and Back' Girl Heart Pendant Necklace 18"